The Swale Singers were founded in 1989. From small beginnings we have grown to be an established choir of some 40 members, primarily from Swaledale and Wensleydale. Rehearsals are on Sunday afternoons in Reeth. We sing an eclectic mix of musical styles, including major choral works, light opera choruses and folk songs, by such as Mozart, Sullivan and Rutter. Concerts in local churches, including in recent years at the Swaledale Festival, are given around three times a year, often to support a charity. Peter Stallworthy studied piano from the age of seven and some six years later was a prize winner in the National Chopin Competition in London. He studied Music at King’s College, London with Thurston Dart and subsequently piano with Ryszard Bakst at the Royal Manchester College of Music, where he was awarded the Ricordi Prize for conducting. Founder conductor of the Manchester Sinfonia, Peter participated in a number of conducting seminars with Sir Charles Groves, George Hurst and Maurice Handford, who he succeeded as principal conductor of the Wilmslow Symphony Orchestra before moving to London to take up a marketing position with CBS Records, now Sony Classical. Over the last thirty or so years, he has established a reputation as a versatile conductor of both orchestras and choirs across the North West and, after sixteen years, has just retired as conductor of the North Staffordshire Symphony Orchestra, one of the UK’s longest established amateur orchestras. He has recently been appointed as Conductor of the Swale Singers, the Richmondshire Choral Society and as guest conductor for next season with the Richmondshire Orchestra. 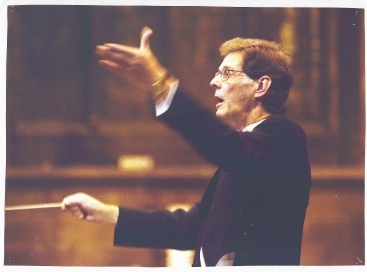 For many years he was conductor of the Barnby Choir and has given numerous concerts as guest conductor with both Stockport Symphony Orchestra and Wilmslow Symphony Orchestra. Some twelve years ago Peter and his wife Hilary formed Cheshire Sinfonia and Cheshire Chorale and both choir and orchestra have given numerous concerts to widespread acclaim. Peter and Hilary live in Burtersett and are looking forward to playing a part in the busy and varied musical life of the Yorkshire Dales. Under Peter we rehearse weekly in term-time, for around three concerts per year, often including the Swaledale Festival event. We are a friendly mixed choir who meet on Sunday afternoons: would you like to join us?